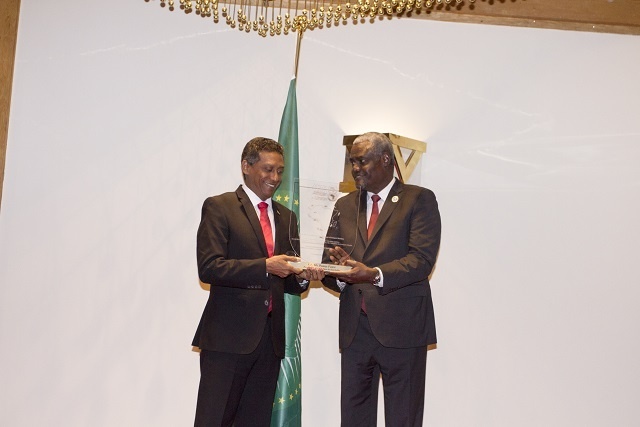 (Seychelles News Agency) - The President of Seychelles, Danny Faure, received the Blue Economy Award on African maritime sectors at a banquet hosted by the African Union Commission on Tuesday at the InterContinental Hotel in Kenya. The award, which was presented by the chairperson of the Commission, Moussa Fakki, recognises countries, associations and individuals who have made significant contributions towards Africa’s Blue Economy Agenda, said State House on Wednesday. “This award recognises Seychelles as a champion of the blue economy in the maritime sector, across the African continent and around the world,’ said Faure. The head of Seychelles, an island nation in the western Indian Ocean, was attending the Blue Economy sustainable Conference which took place in Nairobi, Kenya from November 26-28 at the invitation of the President of Kenya, Uhuru Kenyatta. Faure thanked the AU Commissioner for the award and other partners whose support is critical, such as the UN, the World Bank, the European Union, the Commonwealth, the Indian Ocean Rim Association (IORA) and the Indian Ocean Commission (IOC). Faure also commended the African Shipowners Association and its Secretary General Fumni Folorunsi for her work and added that he is looking forward to the first investment forum for the Pan-African Shipping Line that will be hosted in Seychelles in March. Other beneficiaries of the awards included the President of Kenya, Uhuru Kenyatta, President of Togo, Faure Gnassingbé, and the Prime Minister of Mauritius, Pravind Jugnauth. The banquet was held in honour of heads of states, government officials and delegates attending the Blue Economy sustainable Conference held at the InterContinental Hotel in Nairobi, Kenya.